Breezily chic, this quaint hotel overlooking a spectacular bay on the Ionian island of Kefalonia, is a gem of unique beauty and luxury. Its owners are passionate about good service and it has a loyal staff determined to deliver. Situated near the award-winning Mirtos beach, just a short drive from Lake Melissani and Drogarati Cave, the hotel is ideal as a base for short visits to local attractions and sites. 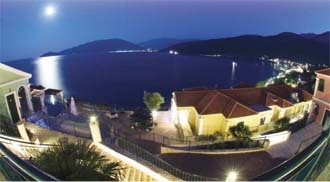 The Kefalonia Bay Palace has 42 individual rooms and six villas with private pools featuring contemporary interior design and hand-made wood furniture. Warm red, green and gold palettes work in harmony with the gorgeous natural surroundings outside, and guest love the modern comforts like LCD Satellite TV, Free Cable Internet Access, a/c, mini bar, safe, luxurious bathrooms, bathrobe, slippers and balconies opening to fantastic sea views. The villas feature steam rooms and private pools with whirlpool. The hotel has a restaurant, cafeteria, bar, 24-hour reception desk, 24-hour room service, free cable Internet access, large swimming pool and children’s pool, playground, laundry service, fitness facilities, Spa, Jacuzzi, Hamman and separate sauna for men and women. The nearby village of Agia Efymia, is a bustling resort with a marina for yachts, lively bars, restaurants and shops. The hotel is a terrific base for exploring Kefalonia, one of the most beautiful Greek islands with spectacular scenery, mountains, perfumed pine forests, aquamarine waters and white beaches. Tour operators organize boat trips to the beaches; cars and motor bikes are available for hire. There are several flights a day from Athens to Kefalonia, and also frequent charter flights from Europe. Daily ferry schedules link the Sami port on Kefalonia with Ithaca, Patras and several times a week with Corfu and Italy.